philw wrote: hit McBob's again today for the white bread sammy . 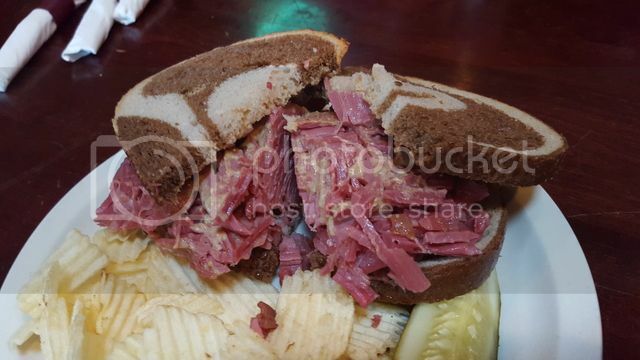 McBob's uses a Miller's sourdough, pan loaf, lite rye for their corned beef sandwich and it does resemble white bread. I won a pair of tickets from The Reader to see the Frank Lloyd Wright exhibition at the Milwaukee Art Museum. It was the last day of this exhibit with an expectation it would draw a crowd. I arrived to the museum at 11:30 to learn I could wait in line 30 minutes or reserve an audio player for $6 at 12:30 pm without waiting in line. Taking advantage of the reservation process, I ordered two audio players for 1:30 pm and left for lunch. I had brought a list of places to eat to allow myself as many options as possible. This particular friend happens to like eating in bars. I was undecided whether to go to McBob's for the corned beef or Sobelman's for their hamburger and roasted pork eggrolls. Both addresses were already in my GPS, I thought I selected Sobelman's until we arrived on McBob's doorstep. What a wonderful mistake, because McBob's was fun to dine at and people watch. We arrived at peak Sunday breakfast, lunch and brunch crowd. We were perched at the end of the bar where drinks were grouped before being whisked away. We were especially intriqued by the garnishes in their Bloody Mary's: celery stalk and a mini kabob of Jack cheese cube, dill pickle, Klements beef stick and a green olive. In a vestibule, there was a handwritten letter praising their corned beef hash and corned beef sandwiches reminding this Lynne Rosetto Kasper of her life in New York City. The ladies stall had a poster signed by the cast of River Dance, though I didn't see Michael Flatley from Chicago on there. Both were wisely screwed onto the wall. I ordered a corned beef and my friend a Rueben. While I wished I had asked for my bread to be toasted for extra firmness, it was still a very good sandwich. 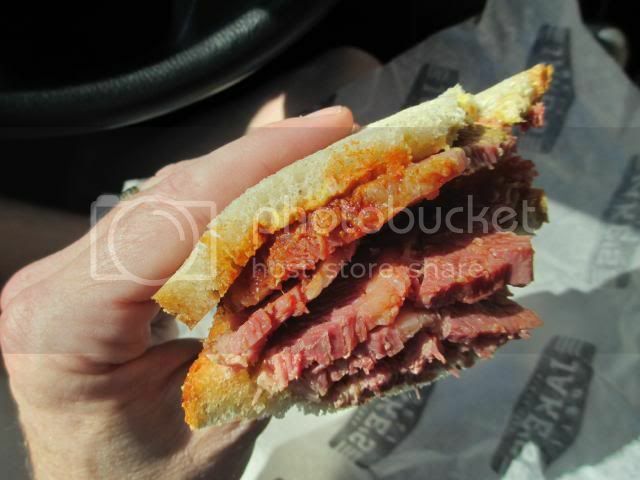 My friend commented it was the best corned beef she had ever had. I advised if it was Saturday, we would have gone to Jakes. She would then have a delightful problem deciding which one may be better. All the other food walking past us looked very good, too. Their corned beef hash appeared made the premises and especially lovely with poached eggs on top. Unlike Kuma's young crowd, we saw a mixed generation there and not necessarily part of a large family table. One couple were clearly in their 80's were eating there by choice, because they were not accompanied by anyone. When we returned to the museum, there was a line several hundred feet long to simply purchase a ticket. There was an equally long line to get into the exhibit. I had my 1:30 pm reservation for the audio players. I walked past all these lines, waited maybe five minutes collecting my player and waiting another 10 minutes to enter. I spent about 90 minutes in the exhibit. When we left around 3 pm, there was a lengthy line to the exhibit and all tickets sold sign at the reception desk. If it were not for reserving those audio players, I'm not sure my patience would have lasted in all those lines. On the way home, I picked up a years supply of anchovies in olive oil. I'm one happy person this evening. Kathy, Sunday breakfast at McBob's was definitely the Wright thing for you and your friend. 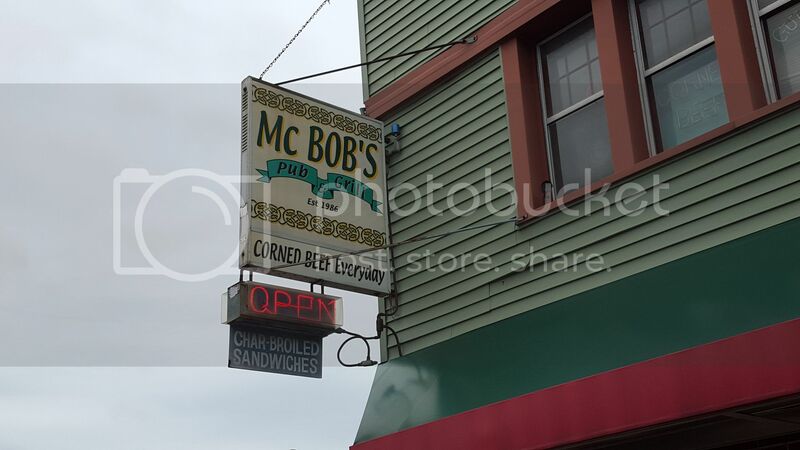 I had a great breakfast of corned beef hash at McBob's, which I posted about in the Wisconsin Breakfast thread. Wow, Steve, I want to take a knife and fork to my monitor and eat that right now! 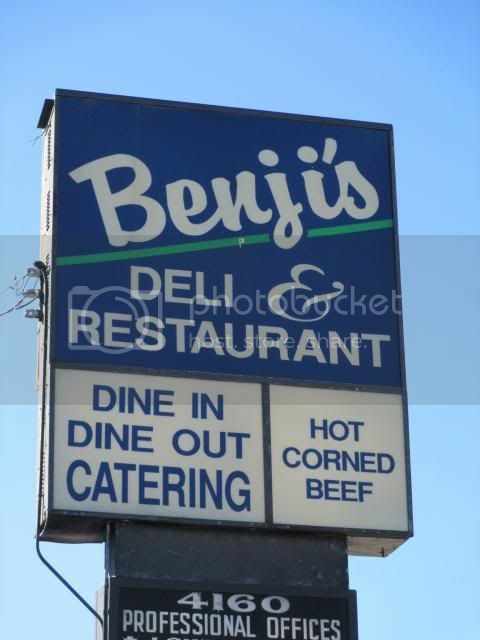 stevez wrote: I had a great breakfast of corned beef hash at McBob's, which I posted about in the Wisconsin Breakfast thread. That sure looks good. They seem to be chopping the corned beef and potatoes more finely (ie, making hash) rather than serving it in giant chunks like they used to (see 7 Sep 07 post). Either way is fine with me. I have come to the conclusion they will never learn to poach eggs properly, so it's better to order them fried. While it's nice to have toast with hash, I'm unable to pass up their homemade scones. According to their website, a scone, 2 eggs and hash is $4.75, a great price for a great breakfast. McBob's has significantly expanded their breakfast hours. Breakfast is now served four days a week: Fri 8-11, Sat 8-12, Sun 8-2, Mon 8-11. I edited my original McBob's breakfast post to reflect this. Rene G wrote: That sure looks good. They seem to be chopping the corned beef and potatoes more finely (ie, making hash) rather than serving it in giant chunks like they used to (see 7 Sep 07 post). Either way is fine with me. Actually, it was somewhat irregular. There were big chunks as well as fine shred (not really chopped). That was one of the things I liked most about their CBH. There's a 2nd picture in the breakfast thread that I linked to in my original post that shows the chunks better. McBob's corned beef made me think of Harrington's, specifically a comment Ken Harrington once made about the difference between kosher-style and Irish-style corned beef: "The Irish took the seasoning out." As corned beef goes, McBob's is fairly bland. The meat was very soft, almost shredded. We had ours on marble rye, which was also quite soft. 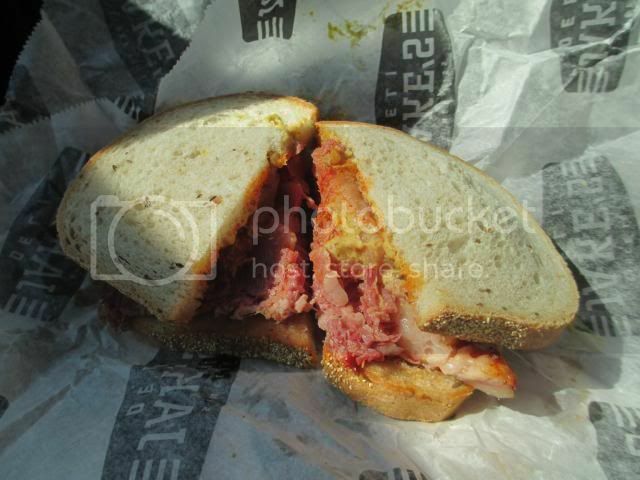 Jake's uses Vienna Corned Beef. 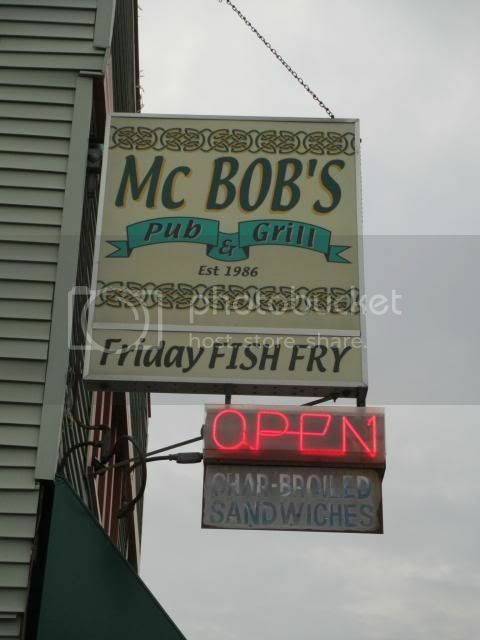 En route to visiting family in Wausau last weekend, we made a quick pit stop at McBob's. With McBob's and Solly's as the competition, it was a tough call, but I finally decided that the opportunity to kill two birds with one stone (corned beef and fish fry) was too much to resist. 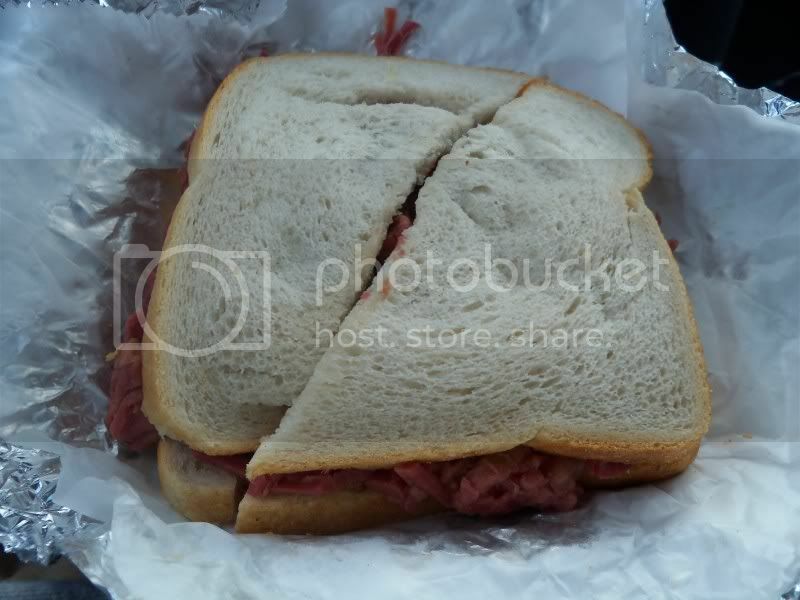 This is a pretty fabulous corned beef sandwich, still steaming when it hit the table. I agree, I'd prefer something other than the pseudo-rye, but I'm happy to allow for a little signature spin. Besides which, for my ladylove (who abhors "bad seeds") this breed of rye lite was right up her alley. 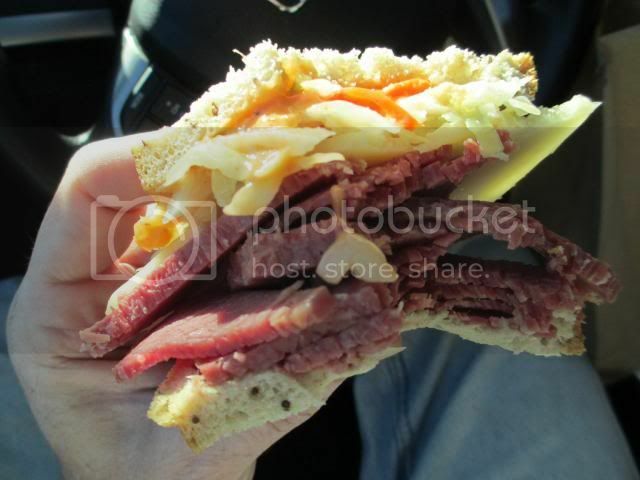 I particularly enjoyed the fact that my sandwich seemed to be intentionally comprised of two different cuts... thicker chunks of a leaner, bright red corned beef (though I stress the -er in leaner), and thinner slices of a darker, fattier, more succulent piece. Our server, when asked about it, managed a hasty explanation while dashing between tables that, unfortunately, I missed. But it made for a nice balance of meat. The fish fry was similarly delightful, though it's been so long since I had a good one that I'm by no means calibrated. I was a little surprised by the heavy seasoning on the breading, but by no means disappointed. For some reason, I expected something more minimal. But it had great crunch, the fish inside was fabulous, and the super deluxe -- perch, walleye and grouper -- provided a great range of fish flavors with which to make an object lesson for the little fella ("Not all white fishes taste the same!"). I would've liked to explore more of the menu, but with such a rare shot at these places, I stuck to the well-worn path. Thanks for the rec, guys! 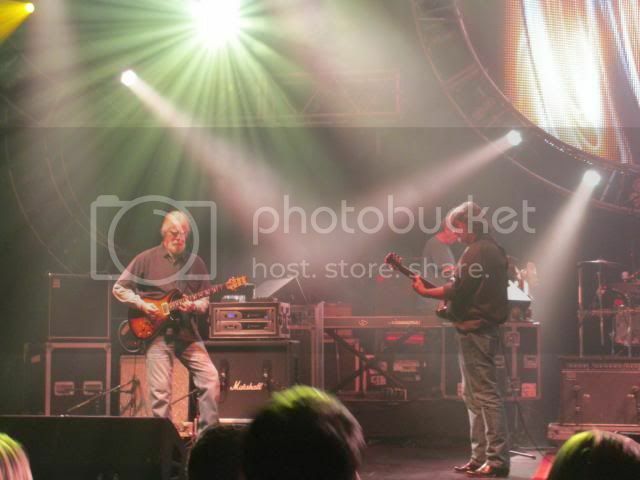 Did a Jake's - McBob's one - two punch on Sat. afternoon before Panic, also threw in a sandwich from Benji's Deli a little nw of here the next morning for breakfast. 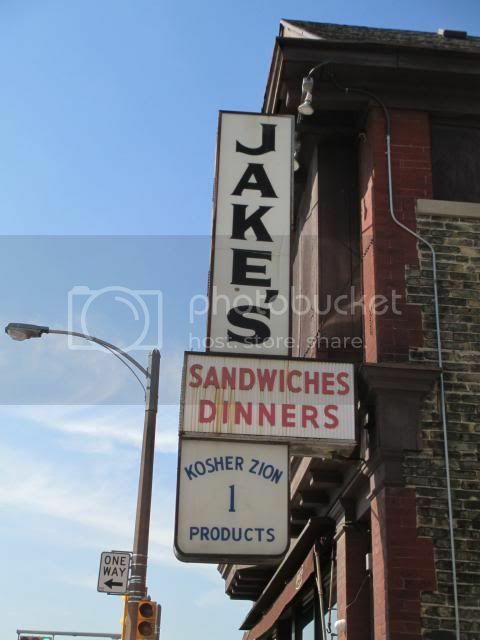 Clear winner between Jake's and McBob's for the corned beef sandwich on rye.. Jake's. Way more succulent than McBob's, McBob's also had a little more of a salt kick. Too dark in Mcbobs(in a good way) for a photo so I didnt bother, loved this place. Griddle/corned beef sandwich making area right behind the bar, all different walks of life. Cold beer and healthy shots as well. pretty fantastic sandwich at 9:00 a.m. after drinking at Bryants Cocktail Lounge(thanks for the tip beef) til after 1:30 a.m. the night before..
Benji's was a cool spot, I want to go back and dine in next time and try their other menu items. 0 guess they were on Man v Food in the past. 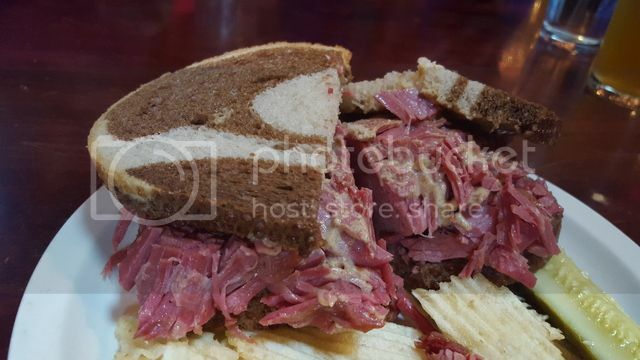 man I wish the boys were still laying it down like back in 2013..
fantastic corned beef sandwich. tender, thick azz tender slices of corned beef- fatty, succulent chunks almost candy like. A nice lip smackin' snack & some cold Cows before going on to Vanguard & then the Tiki joint. McBob's is one of the handfull of places I hit pretty much any time I roll up to Milwaukee. Cool bar with one of the best sandwiches around - Took the girls in for the most recent visit and they dug the sandwich and that top notch hash. the sandwich and some Cow's made for a good snack before some duck Pin bowling at Koz's. Was just there last weekend. Fantastic Ruben and I'll be back ASAP to try the hash. Late breakfast at McBob's, lunch at Glorioso's, dinner at Mader's, and cocktails at Blu at the Pfister hotel made for a hell of a one day trip.